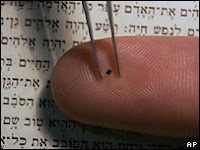 In Israel, scientists have succeeded in writing a version of the Bible on a chip smaller than a pinhead. Now they are working on a machine to shrink people to a size where they can read this nano-Bible comfortably. Ok...so ignore the second sentence. Its 300,000 words in Hebrew were inscribed on a silicon surface at the Haifa Institute of Technology. Scientists say the aim of the project is to increase young people's interest in nanoscience and nanotechnology. The record for the smallest copy is held by a Bible measuring 2.8x3.4x1cm (1.1x1.3x0.4in), weighing 11.75g (0.4 ounces) and containing 1,514 pages. The 0.5sq-mm (0.01sq-in) nano-Bible was written on a silicon surface covered with a thin layer of gold (20nanometres thick - 0.0002mm). A three-day "miracle" drama in Chhattisgarh's industrial town of Raigarh ended on Monday afternoon after a Hindu priest, who had committed suicide promising to return to life within 72 hours of his death, was cremated. Hundreds of people had laid siege around the body of 25-year-old Manoj Baghel, who ended his life on Saturday by consuming poison at a temple in Raigarh, about 200 km northeast of state capital, Raipur. Baghel had claimed that he would come back to life. But he didn't come back. While there is a good chance he may get nominated for Darwin Awards, he gets full points for conviction. Full story here. And talking about religious convictions, here is a two-hour conversation between the Four Horseman of the Apocalypse (also known as the New Atheists): Christopher Hitchens, Richard Dawkins, Daniel Dennett, and Sam Harris. As usual they raise important points and address some of the criticism leveled against them, but their brush strokes remain too large (especially when dealing with Islam). Unfortunately, the video lacks some of the usual fire as they mostly agree with each other - but it is great that they talk about some of the objections people have raised against their approach. Yes ,this last nanobible is amazing but it is not a breakthrought. I saw the first nanobible 2 years ago on this site www.crystal-bible.com. The major interrest is the possibility to wear close to your heart this edition and the possibility to read it with a personal pen microscope! Check this site out! I finally finished both videos of the conversation. It was an interesting listen, but I was struck by Hitchens' comment at the end stating his fatalistic view of the outcome of global religious conflict. Even if he does believe that is the likely outcome, why not follow up his comment with some ideas on how to prevent it? I can think of several right now -- why leave that kind of despairing comment hanging? He may despair that Western Civilization will suffer fatal harm in a coming global conflict, but wouldn't that outcome imply that we are in truth an intellectual and social "evolutionary dead end"? If Western Civilization is genuinely great, prove it and save it. Hmmm...unless it has to do with his solution involving the 42nd airborne. In many ways, he sees the current global conflict in the same black & white way as Bush (and supports his policies in this regard). He may have avoided getting into this debate because Dennett and Dawkins don't agree with him on this issue and it may have derailed the conversation. After I finished watching that, I found the link to Scott Atran's presentation you gave in another post. His talk by and large contradicts nearly everything that Hitchens has to say -- that "Islamo-fascism" is less about Islam and more about disaffected and poorly educated and culturally integrated people fighting a system they view as alien and deliberately oppressive. His suggestion that more has to be done to integrate disaffected people into society is a lot more likely to produce results than Hitchens' secular equivalent of "kill them all, and let God sort them out." Likewise, I'd argue fundamentalism in America is more a function of an complacent, apathetic, and disorganized educational system that lost its way since its peak in the 1950's and 1960's than about religion. I never got the impression that my poorly-performing students in introductory astronomy classes did so because their religion interfered with their ability to process and internalize what I was teaching. It was much more likely to be poor preparation prior to college. I completely agree. There are many places, one can argue, where religion has made things worse. However, it is an oversimplification to singularly focus on religion and ignore other more important factors. I will also post it on the blog.